The Rian Nai Luang Song Phanuad 2517 BE, is made from Nuea Nava Loha, and is both rare, and is also a highly preferred amulet (Niyom) of the many amulets dedicated to his Majesty King Bhumipol Adulyadej (Rama 9). This coin features the image of His Majesty as he was ordained as a Buddhist Monk (Bhikkhu) in the Sangha, before he finally retook his duty of ruler and King of Thailand. This model is made from Nava Loha (9 alchemical sacred metals), and is much rarer and more preferred than the Tong Daeng (copper) and Albaca versions. 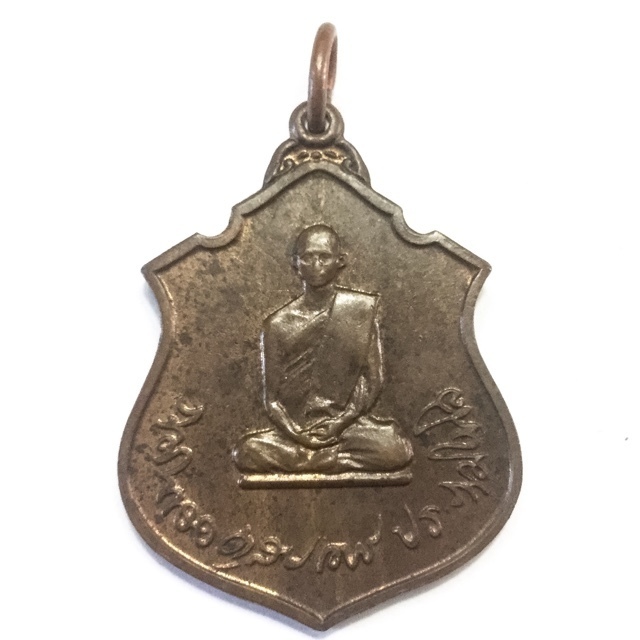 The front face of the shield shaped coin features the image of His Majesty King Bhumipol seated in the meditative poise of a mendicant monk, dressed in the robes of a Bhikkhu. The amulet was sponsored by the Commander Paet Gun of the Gong Tap Sam 3rd Squadron of the Royal Thai Airforce, with Royal Permission, to create these coins, and also the first Pra Kring Putta Chinarat Buddha statues with the Por Bor Ror (Royal Insignia) stamp, some Bucha Statues, and the famous Rian Arm Putta Chinarat shield coins. The coins were made in Nava Loha for special distribution to devotees at the ceremony. The coins were made in Pim Yai and Pim Lek, and produced in Gold, Silver, Nava Loha, Albaca, and Tong Daeng susbtances. The amulet was given a very powerful and important DOUBLE blessing ceremony along with the famous 2517 BE Pra Kring Putta Chinarat statuettes at first the temple of Wat Sutat in Bangkok, and then at Wat Pra Sri Radtana Mahatat in PItsanuloke (Temple of the Chinarat Buddha). The preliminary casting and forging of the sacred metal alloys for this series was performed in the Te Tong empowerment ceremony on 24th July 2516 BE, to smelt and cast the coins and the Pra Kring Buddha statuettes, at Wat Pra Chetupon. His holiness the Sangkaracha Royal head Monk was present to inaugurate and preside over the Buddha Abhiseka Ceremony at Wat Pra Sri Radtana Maha Tat, which was held on 18th January 2517 BE, with 45 other Great Master Monks present to assist with their empowerment and blessings. The rear face of the amulet has the Royal Bor Por Ror (ปภร) Insignia embossed, under the Royal Chada Crown and Aura of the Kindgom's Ruler King Bhumipol Adulyadej of the Chakri Dynasty. The words 'Gong Tap Pak Tee Sam (3rd Royal Air Force Squadron), and the year 2517 BE (๒๕๑๗) are embossed underneath the Insignia. King Bhumipol was an exemplary Monk who walked barefoot around the Sanam Luang area of Bangkok in the vicinity of the Temple, to receive alms from the local folk, who were able to kneel and offer alms to their future King. His diligence and purity as a monk, as as exemplary as his diligence and dedication to his country as a King. Amulets which feature His Majesty during his time as an Ordained Buddhist Monk, are amongst the most popular and rare to find in the pantheon of Royal Amulets. The Buddha Abhiseka was graced with the presence of some of the greatest masters of the time to bless the amulets, including Luang Phu To (Wat Pradoo Chimplee), Luang Por Nuang (Wat Julamani), Luang Por Nor (Wat Klang Ta Ruea), Luang Por Tiam, Luang Por Tong Yoo (Wat Mai Nong Pa-Ong), Luang Por Thin (Wat Pha Lelai), Luang Por Chern (Wat Dtamnak Nuea), and the Great Luang Por Gee (Wat Hoo Chang), amongst many other great names. His Masjesty the King was present for both Buddha Abhiseka Ceremonies and the Piti Te Tong original smelting ceremony, to give his Bendicion. This coin has become very famous for Klaew Klaad life-saving evasion powers to survive deadly accidents and disasters, since many devotees who worship and wore the amulet after the ceremony, were saved in miraculous circumstances, and many news articles kept arising one after the other. The amulet is hence seen as a powerful protector when travelling or entering into dangerous situations, and is very popular with Police, Military and those who have to risk their lives in their daily professions. The amulet is also seen to increase status and bring promotion and respect from one's peers and superiors, and is therefore also popular and recommendable for those who seek job promotion, and especially apt for civil servants to wear, as well as Thai People who revere their King. Apart from its Spiritual and Cultural meaning, the amulet is also a great collector's Classic, and is a respectable amulet to enter into competition, and to wear for protection, and when not wearing, to proudly display in one's showcase. Maker of Amulet:Commander Paet Gun of the Gong Tap Sam 3rd Squadron of the Royal Thai Airforce, with Royal Permission.